As I write this post, the streets are teeming with people jostling and getting ready for the possible onslaught of the “Frankenstorm” Hurricane Sandy. I hope it is just the hyperbole of the century. I’m trying not to get sucked in to the news, into Facebook, etc. It’s good to stay informed but the news and media have certain pull that can debilitate with fear and fascination. 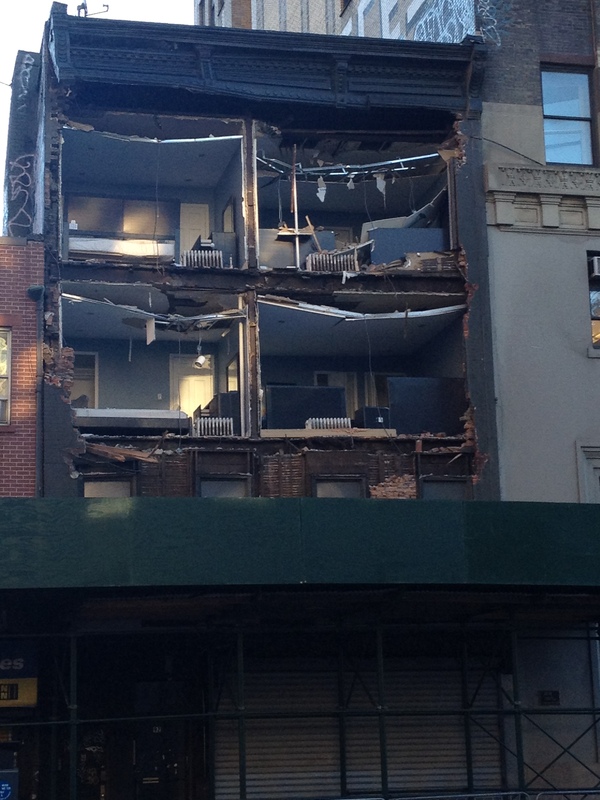 Miraculously, no one was injured when this building’s facade came crashing down. This building is on the way to my walk to the Writer’s Room. The real damage from this storm was on the subway system, Staten Island, the Rockaways, and on the Jersey Shore. blow it all away . . . Compared to other folks in the region, we had to deal with minor inconveniences. 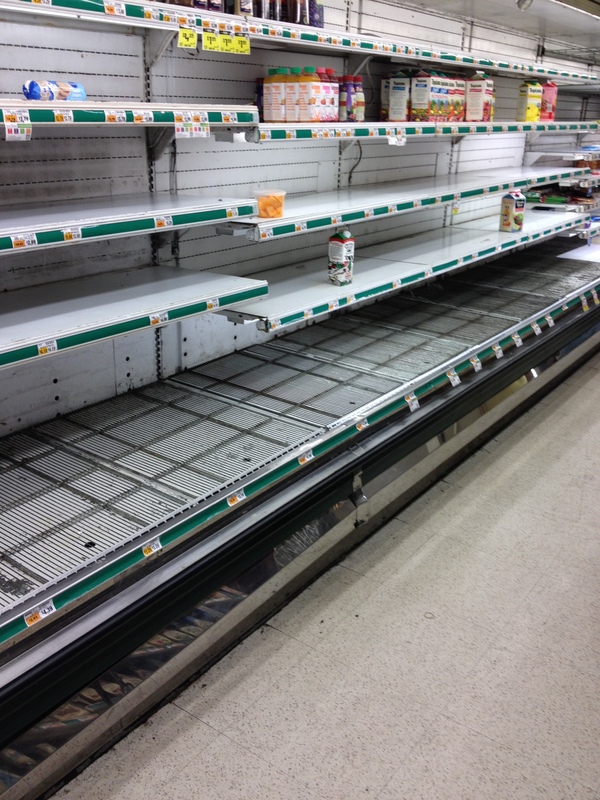 No subway, local grocery stores without power, and gas shortages. Luckily, I could walk to a neighborhood with power and get groceries for my family. * create periods of solitude . . . .
There’s a line between being informed and being totally drained by the news and social media. I haven’t figured out how to surf that line. As Hurricane Sandy approached, I followed the news and did my best to inform friends and former students to pay attention. As it hit and in the aftermath, I continued to monitor the news and social media to see how my friends and former students (some who live in evacuation zones) were doing and to inform people about food distribution zones. But after a while, following so much media and not taking any action was just draining. The Writers Room had no power and no working elevator so I didn’t have my usual quiet “mad scientist in the lab time.” On one of my grocery runs, I spent an hour at a manga cafe to enjoy the normalcy of studying Japanese and doing my “reps.” Sometimes you need to “power up” with quiet time for yourself. Yesterday, I took a modified media break. I just took a few minutes every hour to check on what was going on. At one point, I just took a long nap and lingered in bed. (Not an easy thing to accomplish with children.) 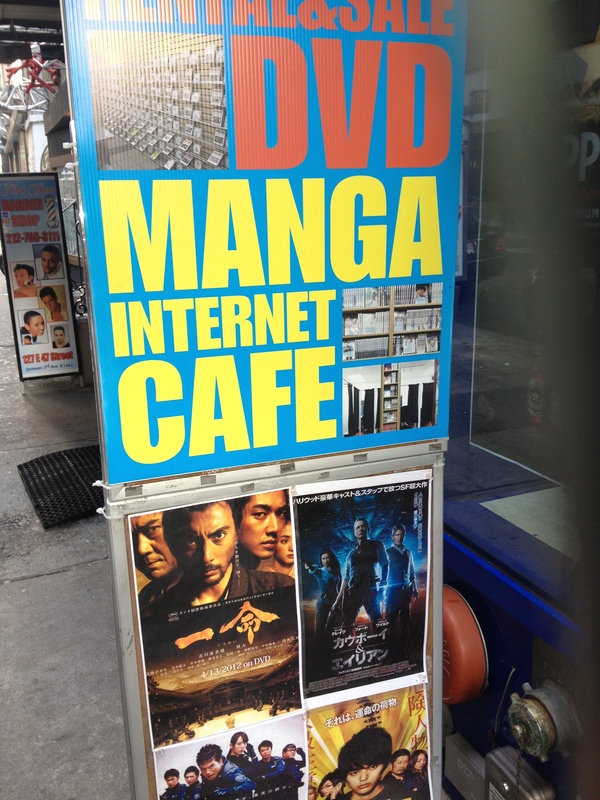 I studied Japanese and shuffled around websites. It was a luxury that many people in the area can’t afford, but what good am I going to be the world if I arrive exhausted, stressed out and on information overload? Be on the lookout for media overload in your life. How can you serve if you don’t know who YOU are amongst all the media chatter? Make time for silence. Create your own media micro-climate but don’t stay in a bubble. Power down so you can power up and be a steady shining light.